The product series are designed with 15", 17" and 19" form factors to provide customer a wide range of options. Edge-to-edge flush touch screen enables easy cleaning, bacteria/dust free, and ergonomic touch features. 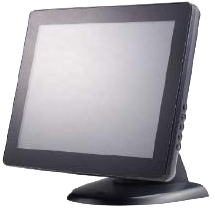 Projected Capacitive touch screen provides multi-touch and gesture input application. Touch screen is sealed to bezel with IP65 protection at front side to prevent liquid and dust ingress. Rear VESA mounting and side mounting holes, providing various mounting options.